Huseyin Bahri Alptekin, I’m Dreaming About Bombay, 2006. 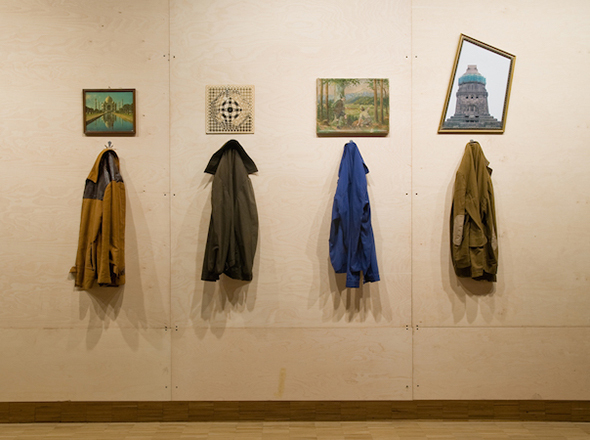 Jackets and found images, 157 x 279 cm. Photo: Serkan Taycan. Courtesy of Rampa, Istanbul. For Frieze London 2016 Rampa will present works by Huseyin Bahri Alptekin (Istanbul, 1957–2007), Hera Buyuktasciyan (Istanbul, 1984) and Michael Rakowitz (New York, 1973). The artists are conceptually minded story-tellers, relating objects and mythologies, personal or otherwise, and looking to ideas of identity, politics, migration, and notions of “otherness.” Yet, they are from different generations, different backgrounds and different viewpoints. Rather than posing a solitary question or perspective on the above ideas, Alptekin’s, Buyuktasciyan’s, and Rakowitz’s works, dictated by wholly different experiencesand manifested in vastly differentiated aesthetics, make Rampa’s booth a cross-generational and multi-layered take on identities and identity politics, on migration and commerce. Among Alptekin’s many successes, in 2007 he represented Turkey in the 52nd Venice Biennial with his installation Don’t Complain. The same year he participated in the exhibition Global Cities at the Tate Modern in London. Exhibitions he participated in, include the São Paolo Biennial (1998); Cetinje Biennial (2002), for which he won the UNESCO Prize; How Latitudes Become Forms, Walker Art Center (2003); Manifesta 5 (2004); 2nd and 3rd Tirana Biennial (2003, 2005); and the Istanbul Biennial (1995, 2005, 2009). The artist’s solo exhibitions are Democratic Luxury, Rampa, Istanbul & M HKA, Antwerp (2015); Hüseyin Bahri Alptekin – Facts, Incidents, Accidents, Circumstances, Situations, Muzeum Sztuki, Łódź (2013), Festival Istambul Agora – Hüseyin Bahri Alptekin, SESC Pompeia, Sao Paulo (2013), I Am Not A Studio Artist, Salt, Istanbul (2011), Global Mockery, Maison de Folie de Wazemmes, Lille (2009) and Kriz: Viva Vaia, Dulcinea Gallery, Istanbul (1999). Buyuktasciyan’s selected exhibitions include: EVA International Biennial, Limerick City, Ireland (2016); Land without Land, Heidelberger Kunstverein, Heidelberg, Germany (2016); Istanbul: Passion, Joy, Fury, MAXXI, the National Museum of XXI Century Arts, Rome (2016); 14th Istanbul Biennial (2015); 56th Venice Biennale, Armenian Pavillion, Venice (2015); Century of Centuries, SALT, Istanbul (2015); Fishbone, State of Concept, Athens (2015); The Jerusalem Sho‘, Jerusalem (2014); The Land Across the Blind Galeri Mana, Istanbul (2014); In Situ PiST///, Istanbul (2013); Envy, Enmity, Embarrassment ARTER, Istanbul (2013); Blur, Weltraum, Munich (2012); Reflecting on Reflection Galeri Mana, Istanbul (2012); Looking for Somewhere to Land, Stockholm (2012); The Afternoon Odyssey SALT, Istanbul (2012); Worthy Hearts, Yerevan (2011). Rakowitz has shown extensively in both the US and abroad. Notable solo exhibitions include; Albright Knox Gallery, Buffalo, NY (2016); The Artist’s Experiment Series, MoMA, NY (2015); BAK, Utrecht, Netherlands (2014); Van Abbemuseum, Eindhoven, Netherlands (2014); The Break Up, Rhona Hoffman Gallery, Chicago, IL (2014); Dar Al Sulh, Traffic, Dubai, UAE (2013); Spoils Park Avenue Restaurant, presented by Creative Time, New York, NY (2011); The worst condition is to pass under a sword which is not one’s own, Lombard-Freid Projects, New York, NY (2009); The invisible enemy should not exist, Lombard-Freid Projects, New York, NY (2007); Endgames, Galleria Alberto Peola, Torino (2006), among many others. Notable group exhibitions include: 14th Istanbul Biennial (2015); In Search of Matisse, Henie Onstad Kunstsenter, Oslo (2015); Yokohama Triennial, Japan (2014); dOCUMENTA (13), Kassel, Germany (2012); Asian Art Biennial, Taiwan (2011); The Jerusalem Show IV, Al Ma’mal Foundation for Contemporary Art, Jerusalem (2010); 16th Sydney Biennial (2008); Gwangju Design Biennale, Gwangju (2007); 10th Istanbul Biennial (2007); T1-Torino Triennale (2005).